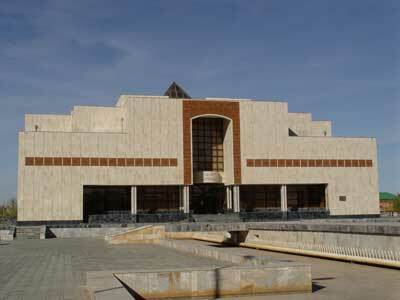 Nukus – the capital of Karakalpakstan – is a young modern city founded in 1932. There are no historical or architectural monuments here, and its main attraction is the Karakalpak State Museum of Art named after Igor Savitskiy. Due to its unique collections of exhibits, this 'museum in the desert', as it is called by world well-known art experts, enjoys the public estimation far beyond the territory of Uzbekistan. They say that cosmonauts were the first of the humans to see the Aral Sea split into two basins. But it took years before the geographical maps began to picture this extraordinary event in the life of our planet. 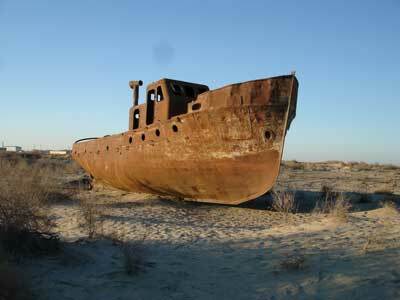 The Aral Sea is relatively young water body. According to one of the hypotheses it appeared about 10 thousand years ago. Twice during its lifetime it grew shallow, but each time its waters rose again to the mark of 55 meters above sea level. 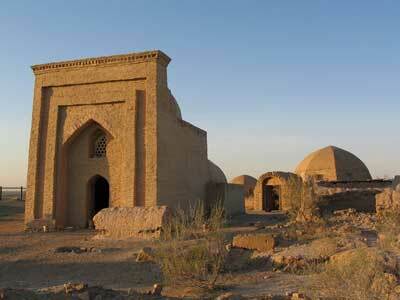 Mizdakhan is a complex of historical monuments located on three hills and a plane between them. The flat top of the west hill is crowned with the ruins of Gyaur-Kala Fortress, built in the 4th century BC. This fortress was used to defend a large town that occupied the eastern hill. Scholars identify Mizdakhan with the town Mazda built in honor of Akhura-Mazda - the main fire-worshippers’ deity who was mentioned in the holy Zoroastrian book Avesta. 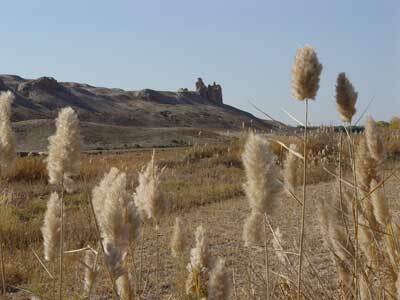 Today the eastern hill hosts the oldest Central Asian necropolis. 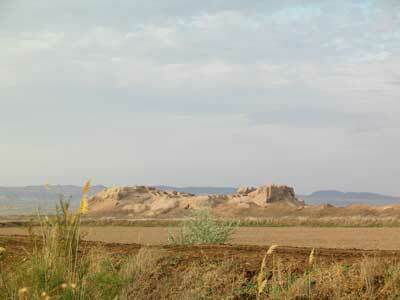 The flat top of the west hill of Mizdakhan Complex, located near Hojeyli, Karakalpakstan, is crowned with the majestic ruins of ancient settlement Gyaur-Kala. Impressive even today, the 10-meter-high fortress walls run along the edges of the steep cliffs of the hill. Within the walls there are complex labyrinth-like remains of two citadels dating back to different epochs. The earliest of them has turrets. Some archeologists believe that these turrets were not only fortifications but also served as cult structures. In the old days, wherever a traveler directed his horse the first things that loomed up before him on his way were the cogged walls of cities-fortresses. 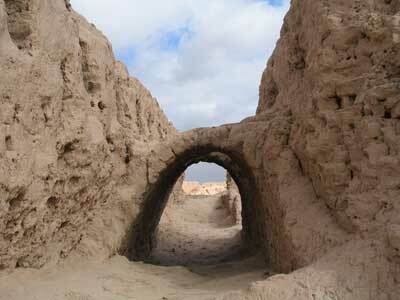 Of these forts only sand-buried ruins or remains of mud walls have survived to our time. The most impressive among them are the majestic ruins of the ancient fortified capital of antique Khoresm, known as Toprak-Kala. The origination of this settlement dates back to early 1st millennium. 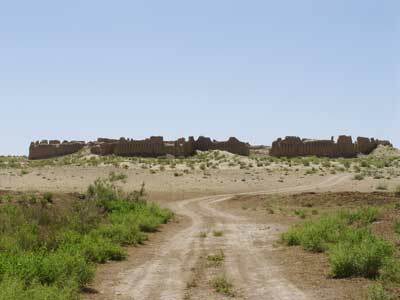 The ancient settlement Ayaz-Kala is situated at a distance of 20 kilometers to the northeast of Toprak-Kala, the capital of ancient Khorezm, between the drifting sands of the Kyzylkum Desert and the holy mountains Sultanuizdag. The choice of the site for this fortified settlement by its unknown builders deserves our admiration.